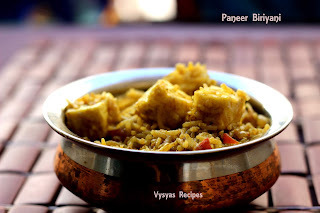 Paneer Biriyani is a Delicious Rice Recipe,made with Cubed Paneer & Spices. if you run out of Veggies,you can try this Recipe. Spiced Rice with Paneer tastes awesome. My Husband is a Big Fan of this Biriyani. if you are Vegetarians,want to try different type of Biriyani, can try this yummy Recipe. Easy Paneer Biriyani Prep Time : 15 min. Paneer - 150 gms.Basmathi Rice /Jeeraga Samba Rice - 1 Cup.Water - 2 Cup.Onion - 2.Tomato - 2.Puthina/Mint - 20.Coriander leaves - 2 tbsp.salt - as neededoil - to frychilli Powder - 1 tspTurmeric Powder - 1/8 tsp. Cinnamon - 1 pieceCloves - 4.Cardomomom - 2. Soak the Rice for 1/2 an hour. Grind the Ingredients Mentioned in 'To Grind' Column.Heat the oil, add Cinnamon, Cloves, Cardomom. Saute for few Minutes till you get Nice Aroma.Add Chopped Onions, Saute till it turns Pink.Add chopped Tomatoes, Coriander leaves & Mint leaves. Saute till tomatoes turns Mushy. Then add Ground Paste, Saute for 2 Minutes. Drain the Rice (Reserve Water) Completely & add to the Cooker, Saute for 2 - 3 minutes. Then add Reserved water,Chilli Powder, Salt.Mix Well.